This image is so pretty but I wondered just how to color it because there aren't direct lines to watercolor inside of. So I chose a couple of embossing powders to combine to created the "green" powder I desired. 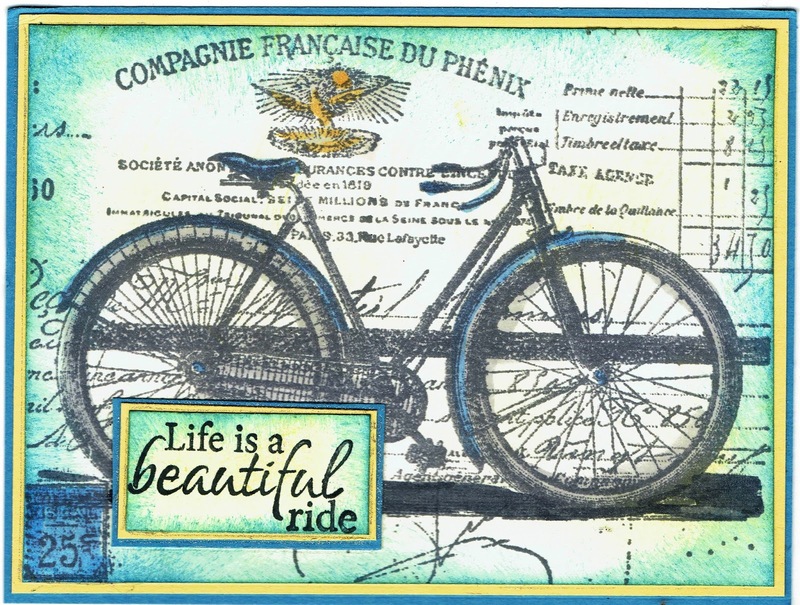 I stamped the image with Versamark ink and covered the ink with the embossing powder mixture I created. Then I used Twinkling H2Os in several shades of pink and fuscia. The verse is heat embossed on vellum, torn around, and sponged. Ribbons and pearls add a lovely embellishment. 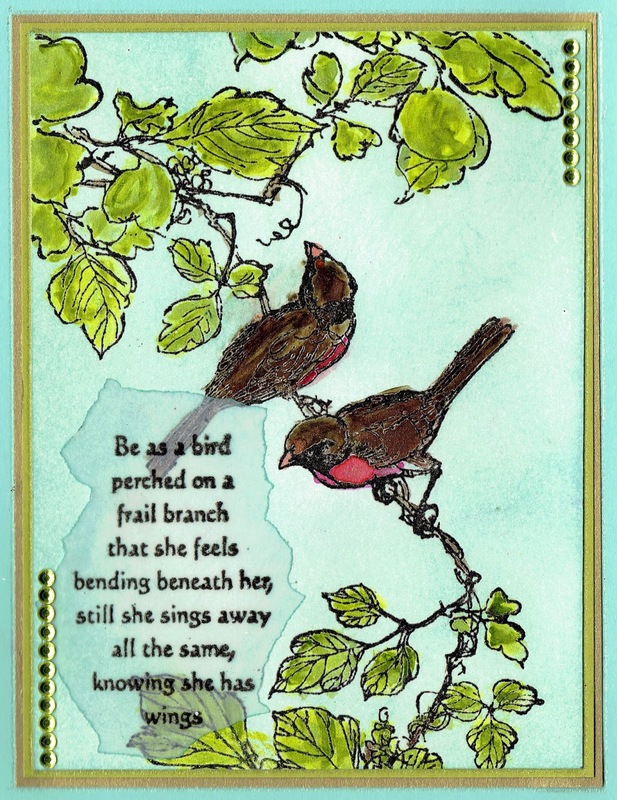 I used the lovely new May Technique Junkie release of Watercolor Birds - http://techniquejunkies.com/watercolor-birds/ to create this card. The verse comes from an older word set called Wings Quotes - http://techniquejunkies.com/wings-quotes/ which was heat embossed on vellum. I ran the vellum through my Xyron machine and while the vellum was still attached to the backing, I sponged the edges to give it some definition. The birds were painted with Twinkling H20s and the sky was sponged. Bling was added as an embellishment. Click on the link, and there is another place to request to join. One of the team will approve you. 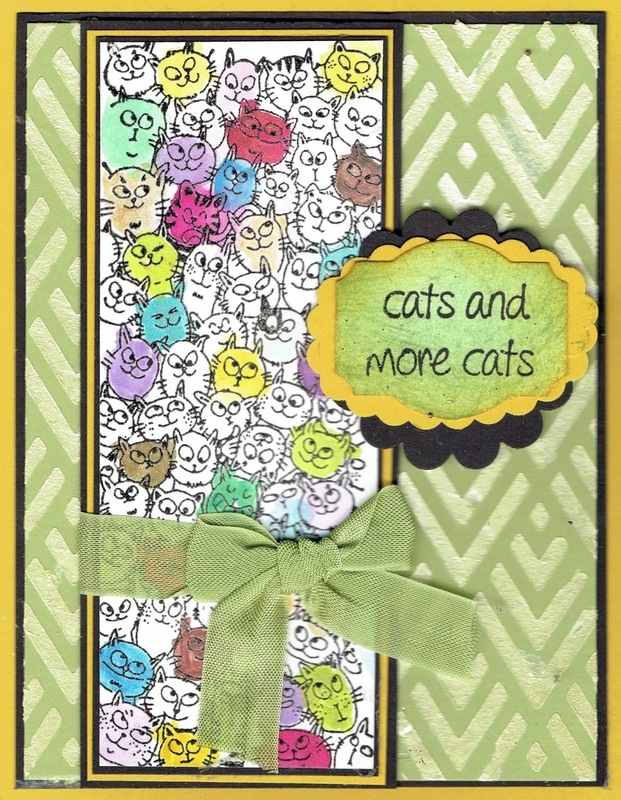 I used these two Technique Junkies stamps: Crazy Cat Border - http://techniquejunkies.com/crazy-cat-border/, and Cats and More Cats - http://techniquejunkies.com/cats-and-more-cats/. I used one of the fun A Colorful Life stencils - http://techniquejunkies.com/a-colorful-life-stencils/. I used Art Nuvo mouse - http://techniquejunkies.com/products-and-accessories/nuvo-mousse - through the stencil to create the background. You spread the mouse as though you "buttering a slice of bread." 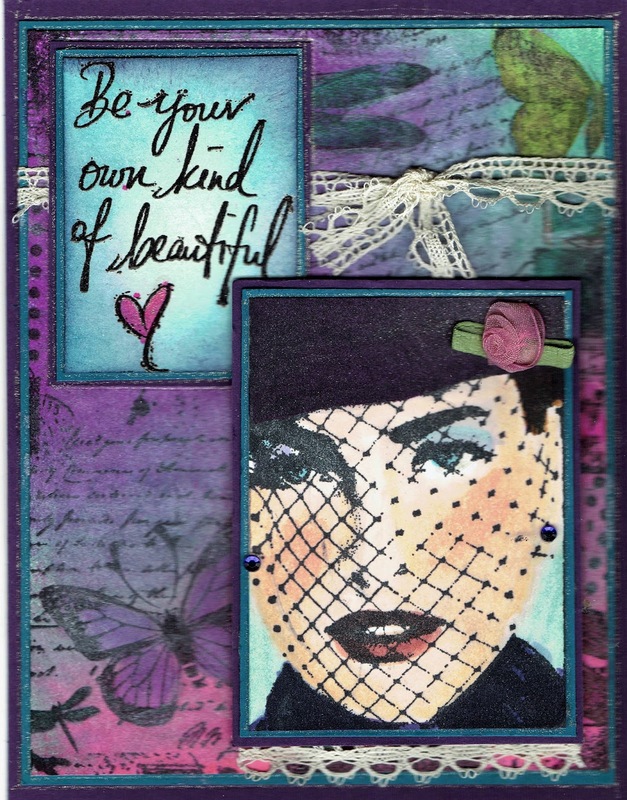 See Pat Huntoon's tutorial here on how to use this neat product: http://techniquejunkies.blogspot.com/2017/04/tj-inkspirations-retro-card-with-nuvo.html . The cats and the verse were stamped with Versafine black ink, covered with clear embossing powder and heat embossed. The verse was punched out and sponged, then layered with other punched out shapes. I felt it would too much to paint every cat so I just chose cats at random and painted them with various colors of Twinkling H2Os. 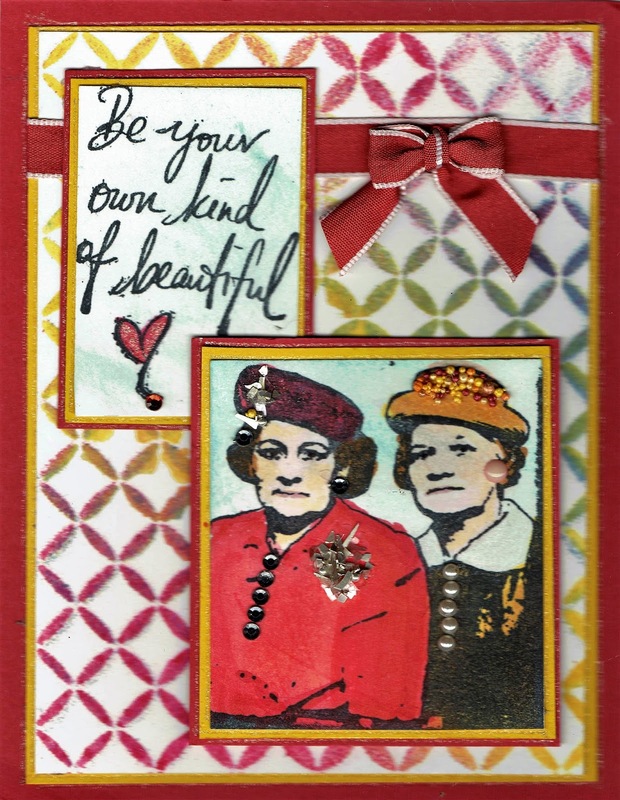 Layers and a ribbon complete the card. ; and Happy Father's Day (a May 2017 Release) - http://techniquejunkies.com/happy-fathers-day/. 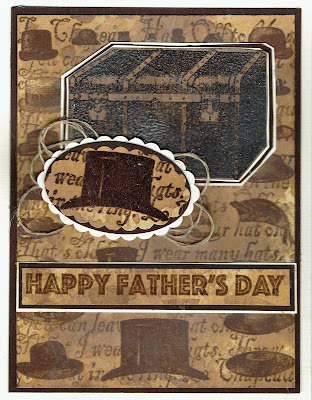 I also used Distress Oxide inks - http://techniquejunkies.com/12-pack-of-ranger-tim-holtz-distress-oxide-in-pads/ - to create the vintage on the vanilla card stock I used to create all of the elements on this card. I heat embossed with dark brown ink and clear embossing powder on the large trunk, the hat in the oval, and the greeting. The base card and all of the various element are layered on vanilla card stock. To get the bottom layered oval I punched out two vanilla ovals. I cut both of them in half. One was cut in half horizontally and the other was cut in half vertically. Then I just layered them. I wrapped line thread around my fingers, then twisted it a bit an adhered the thread to glue dots underneath the oval. It is a very masculine card -- and it was relatively easy. I chose to use Twinkling H2Os to create the background. I lightly - very lightly - spritzed the card stock with water and smeared it around to cover. Then I added various colors of the Twinkling H2Os to please my own eye. I heat set it to dry so as to not warp the card stock any more than necessary. I used my embossing buddy packet over the top so I could create a "clean" space in which to heat emboss the focal image. I stamped the image with Versafine Black ink and used clear embossing powder over the image. Then I heat set it all. I repeated the above process for the verse. 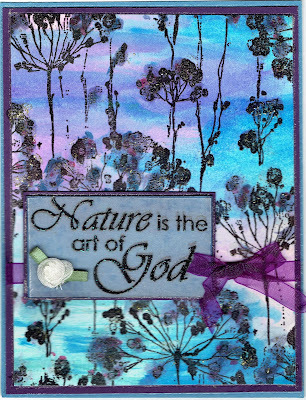 The stamps I used are Watercolor Flowers - http://techniquejunkies.com/watercolor-flowers/; and Art of God - http://techniquejunkies.com/art-of-god/. I used a glitter pen around the edge of the layers of card stock, a ribbon, and a ribbon flower from my stash. These two Technique Junkies stamp images go together so well! 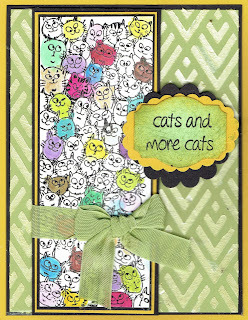 The stamps are Crazy Cat Border - , and Cats and More Cats - http://techniquejunkies.com/cats-and-more-cats/ . 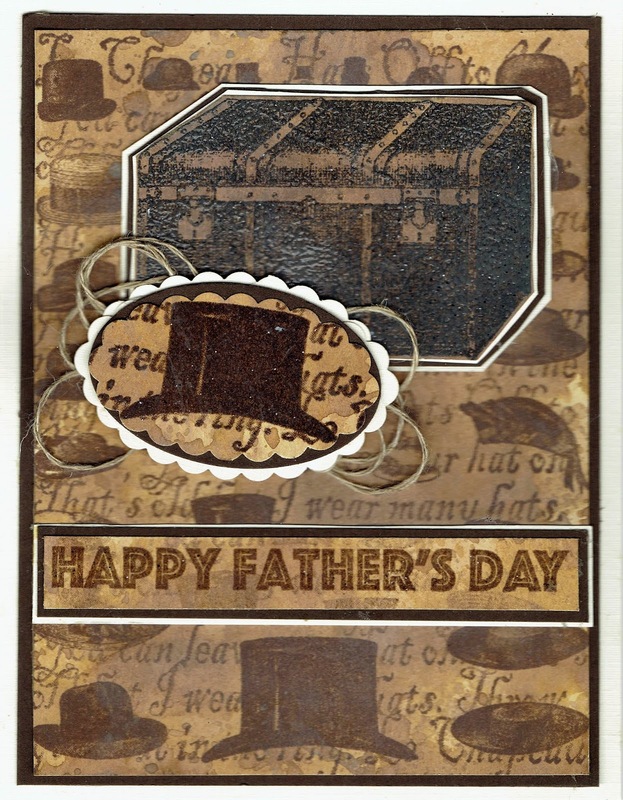 I used Distress Oxide inks - http://techniquejunkies.com/12-pack-of-ranger-tim-holtz-distress-oxide-in-pads/ - in a manner similar to the Antique Glimmers technique and then heat dried the card stock. And these wonderful inks are eligible for the 10% off discount code on my sidebar. I stamped the image with Versafine black ink and cover the image with clear embossing powder and heat set. Then I randomly painted some of the cats with Twinkly H2Os. I didn't paint all of them by any means - perhaps only about 9 cat faces were painted. The card stock with the trunk trunks had been embossed in an embossing folder and then the raised parts with highlighted with regular Distress inks. The verse was stamped and heat embossed, punched and the border in black was also punched out, cut in half and used to create a border for the verse. A ruffled ribbon was added at the bottom. , Copic markers, sponging, Twinkling H2Os, and Wink of Stella pens. Embellishments include lace, bling for the ear rings, and a tiny ribbon flower. It also qualifies for the Oldie but Goodie challenge. All of the stamps used are Technique Junkie stamps: Dragonfly Collage - http://techniquejunkies.com/dragonfly-collage /, Veiled Woman - http://techniquejunkies.com/own-kind-of-beautiful/, and Own Kind of Beautiful - http://techniquejunkies.com/own-kind-of-beautiful/. I first sprayed the white card stock with the Art Anthology Coloration Sprays. 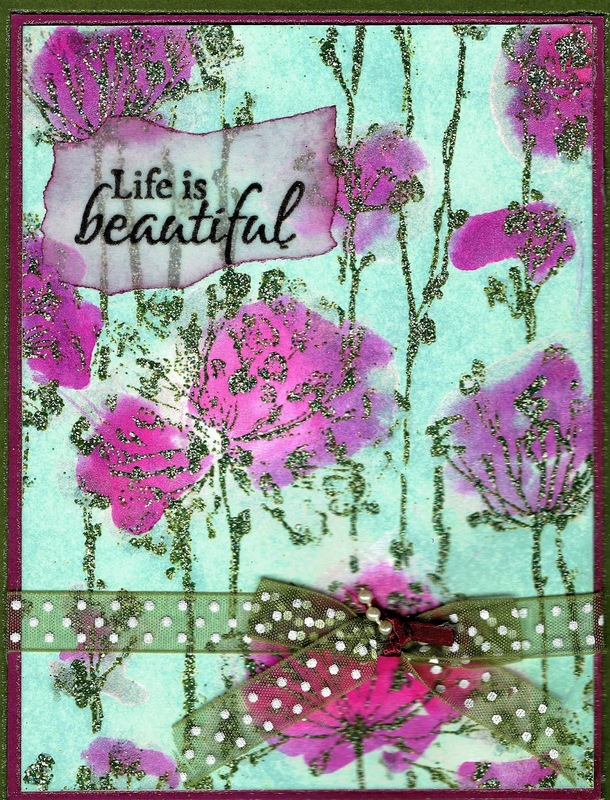 I stamped the Dragonfly Collage stamp, and then highlighted certain areas with Twinkling H2Os. The Veiled Woman was stamped with black Memento ink and colored with Copic markers. I used Wink of Atella over her hat and coat to add visual interest. The verse was stamped with black Versafine ink and heat embossed with clear embossing powder. I used the clear Wink of Stella pen over the heart. The edges of both the verse and the woman were sponged with blue ink. The lace trim on the bottom on the woman was adhered with red line tape on the back. This is a birthday card for one of my daughters. It encompasses two of her loves (besides her family of course!). She loves cats, and loves to read. 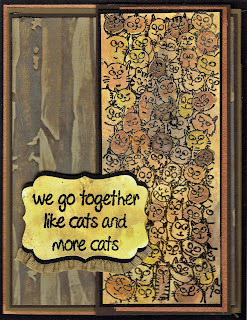 I used three Technique Junkie Stamps - Crazy Cat Border - http://techniquejunkies.com/crazy-cat-border/, one of the sayings in the Bookworms set - http://techniquejunkies.com/bookworms-set-of-6/ , and Random ABC background - http://techniquejunkies.com/random-abcs/. 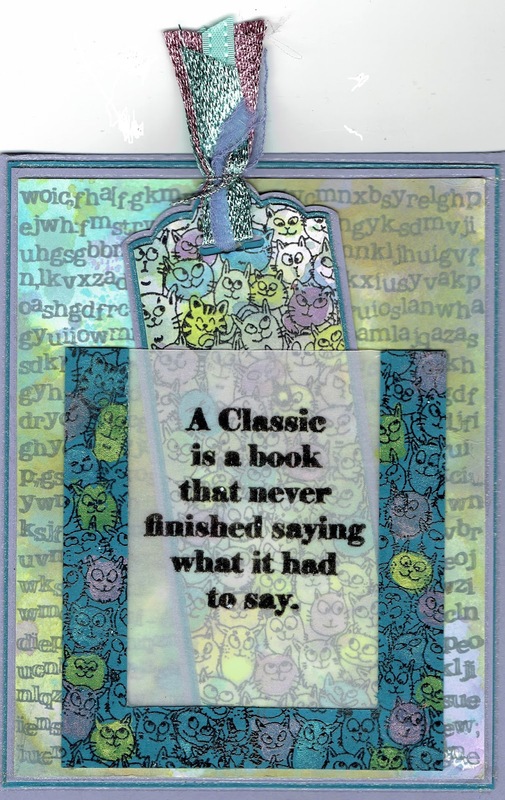 I created the background paper for both the first layer and the the book mark with Distress Oxide inks - http://techniquejunkies.com/12-pack-of-ranger-tim-holtz-distress-oxide-in-pads/ - in the same manner as the Antique Glimmers technique. And these wonderful inks are eligible for the 10% off discount code on my sidebar. 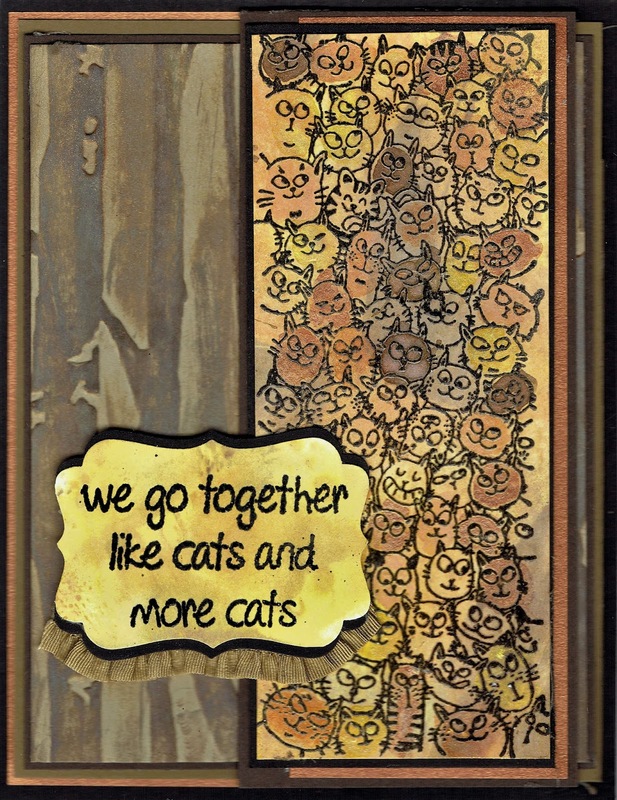 I used Twinkling H2Os and randomly colored in some of the cats on the bookmark and the pocket frame. Since adhesives show through under vellum, I created a frame from card stock stamped with the Crazy Cat border stamp. I adhered the vellum with my ATG adhesive, and attached it to the base card with the same adhesive. I tied ribbons through the tag hole to pull the book mark out. My daughter will love all of this! On Saturday I will attend the birthday party for twin daughters of a friend of mine. I believe they turn 13. I created similar cards but different. Although these twins are both girls they are very definitely fraternal. Not only do they not look alike, their personalities are totally different. These are the cards I created. The colors are the same but flipped. I am showing you the outside of one and the inside of the second. I created the background paper on the front using Distress Oxide inks - http://techniquejunkies.com/12-pack-of-ranger-tim-holtz-distress-oxide-in-pads/ . Obviously most of the images on the card are from dies. I added Wink of Stella on the balloons and the bows. 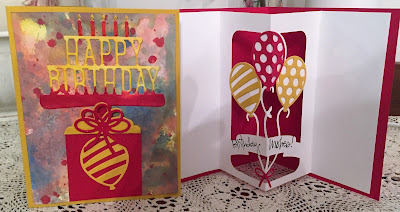 However, I did use a Technique Junkies Stamp - Birthday Wishes - http://techniquejunkies.com/birthday-wishes/. I stamped one word on each side of the banner. Here is a close-up view. I hope the girls enjoy their birthday card! Every now then we really like a simple card -- especially if it is for a man. Men do not usually like a fru-fru type card. This card fits that need. This is also a shaker card. I chose a bunch of trip related/masculine background papers and punch them out. I also punched out a hole. The word "GO" is behind the sprinkle stuff for the shaker card. Hopefully, some day the static may dissipate and the sprinke stuff will become unstaticy and move freely behind the acetate. I used the words Happy Father's Day on the front of the car. 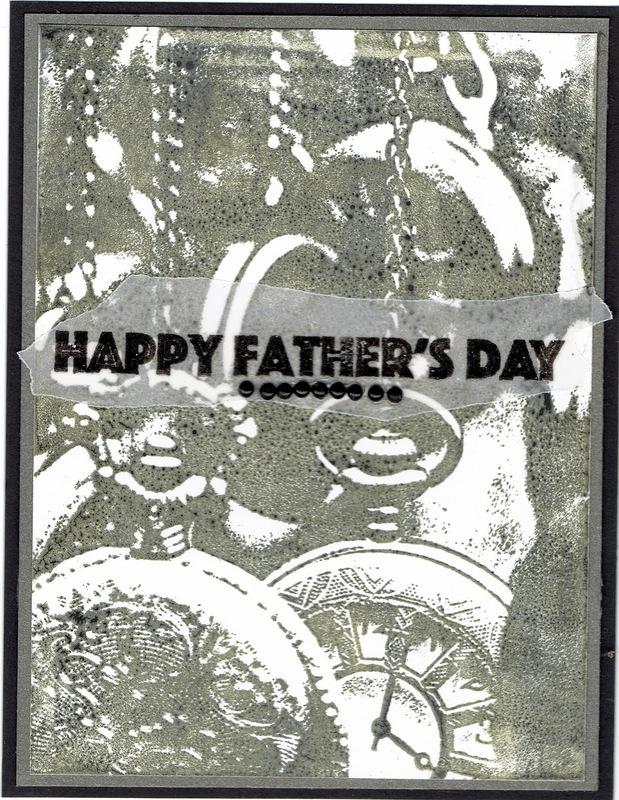 It is a Technique Junkies stamp and is a May Release - http://techniquejunkies.com/happy-fathers-day/. Can you think of more things to ride on other than what I listed? I would be interested to know what you thought of! 3. Riding a rocket to the space station! 3. Riding a wave4. Riding the wind. 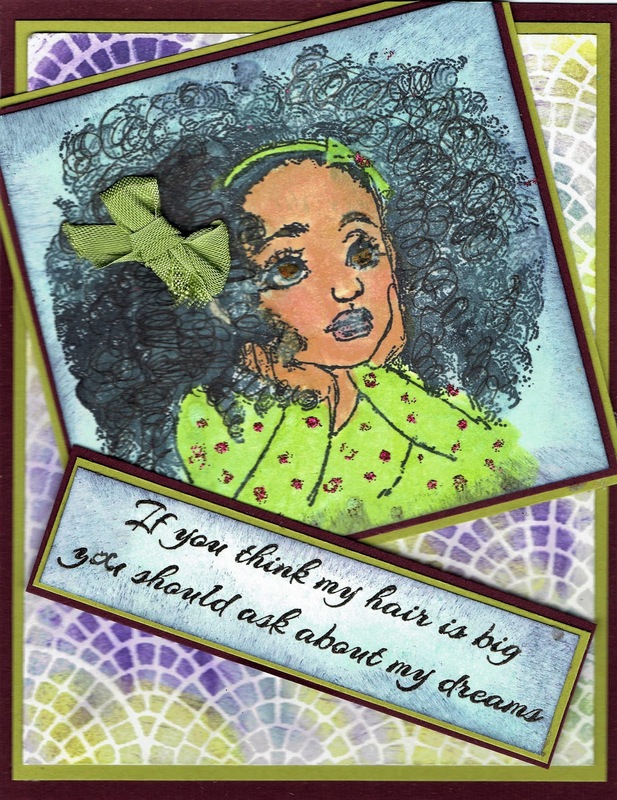 I colored the image with my Copic markers, sponged the edges, and layered the card and the verse. So many times our culture equates beauty with youth. It just isn't so. Beauty is from inside. What is on the outside is only the shell -- the covering of our true beauty. and pair that image with the Technique Junkie May "Release of Own Kind of Beautiful - http://techniquejunkies.com/own-kind-of-beautiful/ . - for the background. The ladies are colored with Copic Markers. I used Prills and gold stuff from my stash. I placed a ribbon around the top two layers and tied a bow and attached it with a glue dot. The buttons are tiny pearls that are self adhesive. Don't forget that Monday is the last day for the 15% for the Technique Junkies May releases. Here is the direct link for those. http://techniquejunkies.com/may-2017-release/ . For everything else you can use the coupon code on my side bar for 10% of everything else. It is a good deal! 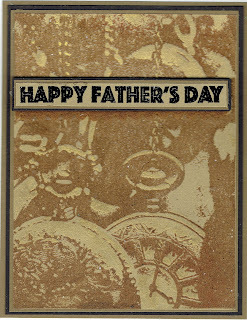 For this card, I used the new May release Technique Junkies stamps of Pocketwatches - http://techniquejunkies.com/pocketwatches/ and Happy Father's Day - http://techniquejunkies.com/happy-fathers-day/ . If you want to see all of the May release, you can do that here - http://techniquejunkies.com/may-2017-release/ . 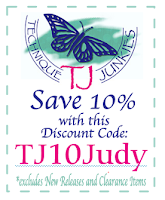 And please remember that there is a 15% off discount through May 8 for each and everyone of the new Technique Junkies Stamps May releases. 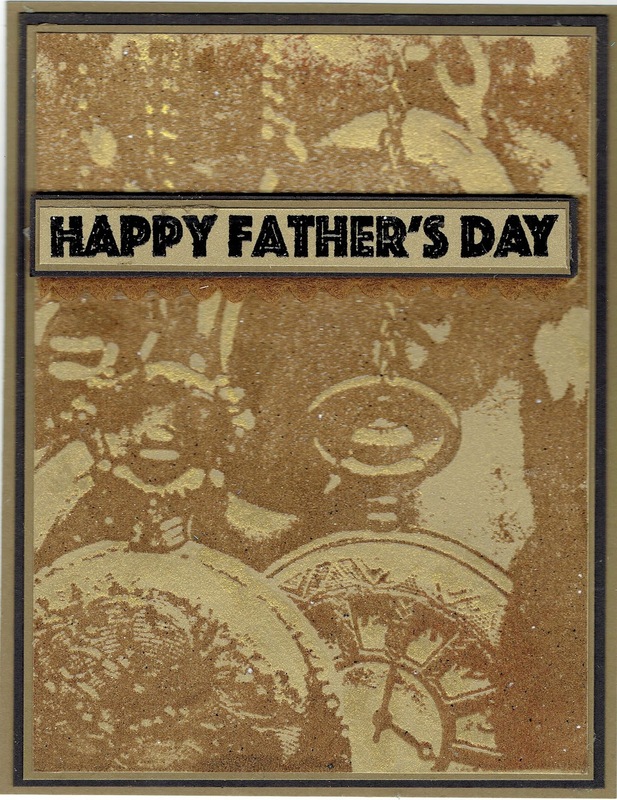 To create this card, the image was stamped on heavy gold card stock. I used a tan embossing powder over the Versamark stamped Pocketwatches image. Then I used a clear ?Wink of Stella marker over the gold card card stock to add additional shimmer. The verse was stamped on gold card stock with black Versafine ink and embossed with detail black embossing powder. Both the focal image and the greeting were layered on a tan card stock, and then black card stock. I added a tan felt rick rack on the bottom edge of the greeting. 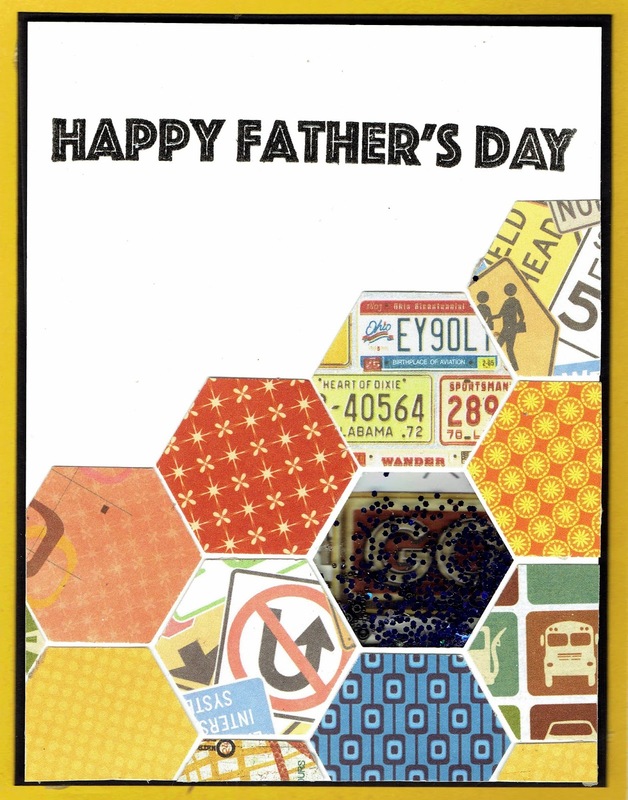 All of the elements work together very well to create a masculine card for this important holiday to remember our Fathers. 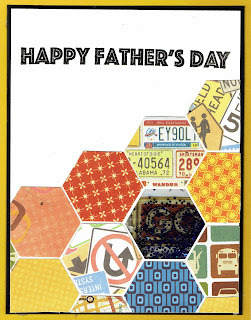 This was a very easy card to create and would be relatively easy to duplicate. So have you taken advantage the sale for this month for Technique Junkies? If not -- have you tjoughj why haven't I created my order? Oh Happy May! And Happy Blog Hop Day! May is a glorious month. In most parts of the country, we know winter is really over. Snow is pretty to look at, fun for kids to play, but it is cold. The older I get the less I like the cold! Which is why I spent from January 4 to April 11 in Florida. And I came back too soon! It is still too cold here! May generally brings thoughts of gardens and flowers. And May also brings NEW Technique Junkies stamps! And they are great! So sit back and enjoy! Here is the link for the entire May Technique Junkies Stamps May Release - techniquejunkies.com/may-2017-release/. 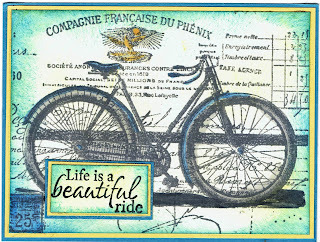 And Pat is offering all of these lovely stamps with a 15% off discount through May 8! If you didn't come to me from Beth Norman: http://www.sunflowers-dragonflies.ca/, then you should start here for the full Blog Hop rotation: http://techniquejunkies.blogspot.com/ . And of course, all stamps on this post are Technique Junkies Stamps. 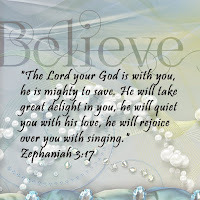 And the other thing you need to know is the verse is so so so like my special girl! Her thoughts and ideas and language skills are above her years. We knew she gifted in language when she was 2 1/2 and using 10 word sentences correctly. And in first grade she was reading chapter books the first of October. Now I know there are other children who were doing these things earlier than she did them and those children are super uber bright. But as a retired first grade teacher what she was doing was still much earlier than the norm. Her sisters are also bright -- but normally bright. And no one compares the girls academic achievement to each other. We love them all the same! 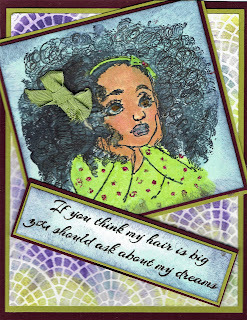 This little girl is stamped with Memento black ink and colored in with Copic markers. It is called Big Dreams - www.techniquejunkies.com/big-dreams/. I also used a very fine tipped black pen to go over and highlight her lovely curls. Stickles glitter glue are the spots on her shirt. I used an Art Anthology stencil with Art Anthology Colorations sprays for the background. The first was stamped with Versafine black and heat embossed with detail black embossing powder. 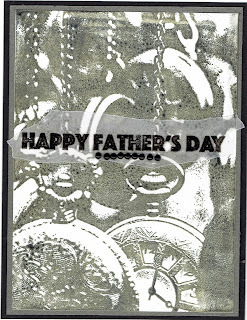 My next card uses stamps called Pocket Watches - http://techniquejunkies.com/pocketwatches/ and Happy Father's Day - www.techniquejunkies.com/happy-fathers-day/. do not use photo paper. Photo paper has emulsion stuff on the surface which when liquid hits turns to a mess unless it is ink designed to print on photo paper. I used dye based ink. I use a rubber brayer to ink the stamp. Run the brayer across the wide edge of the ink pad a few times. Do not load a ton of ink on the brayer. Then run the brayer from the bottom or the top of the rubber inking it up. Then reink your brayer. Now run the brayer from side to side on the rubber. This way you will know for sure that all of the tiny detailed lined lines on the stamp will have ink. Now pick up your glossy card stock and lay the glossy side down on the surface of the stamp. Hold it in place, and gently press your fingers across the back of the card stock. Gently pull the card stock off of the stamp and lay it aside to fully air dry or dry it with a heat tool. One it is dry you can layer it as much as you wish. I heat embossed the greeting with clear embossing powder on vellum. I used my Xyron machine to add adhesive tot he back of the vellum. A few black beads finishes the card. 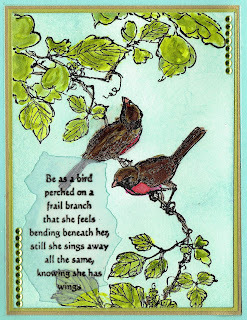 My last card uses Watercolor Birds - www.techniquejunkies.com/…/www.techniquej…/watercolor-birds/ and only one word from Beauty of Winter -http://techniquejunkies.com/beauty-of-winter/ . 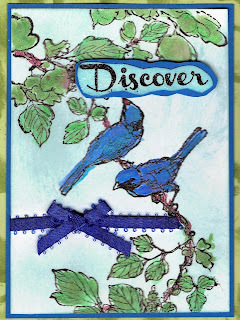 I stamped the Watercolor Birds stamp with Versafine black ink and heat embossed it with detail black embossing powder. I did the same with the word Discover. I used my Twinkling H2Os to paint the image. I cut around the word and the layer of blue card stock. I attached with ribbon as an embellishment. And here is the rotation for the full Technique Junkies Design Team -- and we have new members and their work is just awesome! Be sure to look at each one's art work. And don't forget there is that 15% discount through May 8 on the May Release Technique Junkies Stamps.